Exceptional smoothness of a permanent lead. These pencils are designed to significantly extend the life of creative professionals' work. To enhance the artistic possibilities and effects, 2 colourless blending sticks have been added to the range in order to unify, mix and intensify the colours. Recommended for mixing and shading, working blends or for shading and rubbing with the white pencil. A bit about the brand: Caran d’Ache is always searching for technical innovations and it demonstrates its Swiss Made expertise in colours to create stunning art materials. 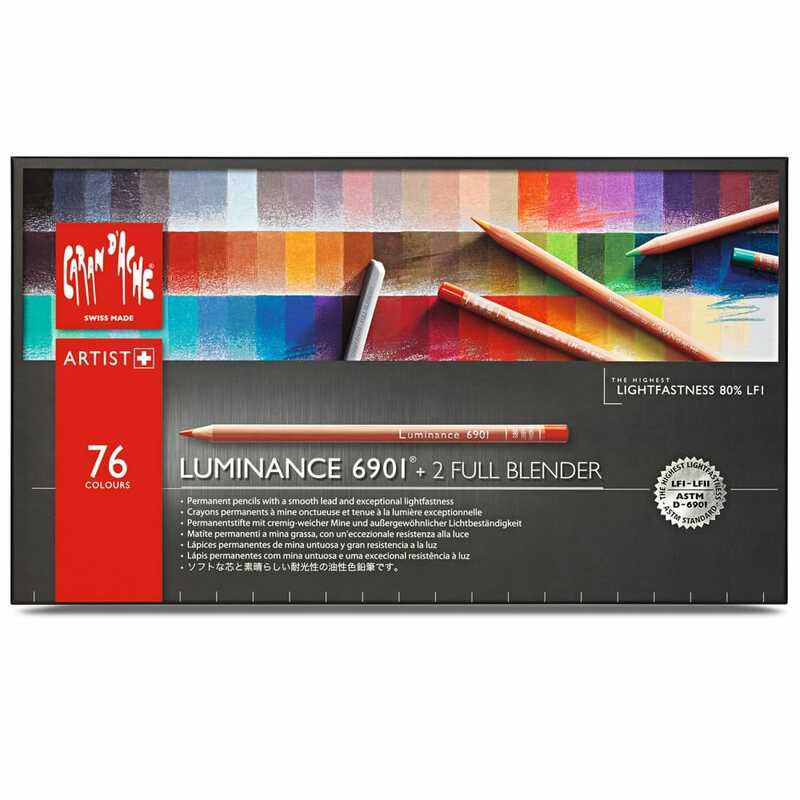 Showing 3 Caran D'Ache Luminance 6901 Colour Pencils Box of 76 reviews. Average rating of Excellent. Would you like to write a review? Incredible pencils. These are to use the term in a better manner "Weapons of mass Creations". The pinnacle of Coloured Pencils and some. I use a vast array of Caran d'Ache products, as I safely know I can have 100% faith in them giving me total control. The Luminance just strengthens that faith. They come in an amazing colour range of the creamy pigments and if used correctly, lightly laying down the pigment, they'll surprisingly hold a good point, not over blunting or worse still snapping. Plus the ability to blend and mix with ease and freedom, giving a near endless colour palette. I've also found they they work well with the Faber Castell Polychromos. Infact they compliment and blend with each other perfectly. The best of both worlds you could say. These are the most beautiful colour pencils. Yes, they do cost a lot but they are just about the best pencils you can buy in the UK. They come really well packaged in a very sturdy box and the colour range is wonderful. If you are serious about colour pencil drawing then I would definitely recommend these. Excellent coloured pencils. Top quality. I bought these from Crafty Arts because they sold the pencils at the best price I could find online. They arrived in perfect condition and very quickly. Extremely happy with my purchase.